Why is it so difficult for many people to reach their ideal body composition goal or health & fitness goal? Many people will put it down to setbacks such as time restraints due to e.g. work and family commitments, but more often than not the real reason will always stem from not having the right mindset. We all have work commitments, some have bigger work loads than others granted- however, if we really want something in life we have to figure out a plan of action to go and get it right? At Fitter Nottingham we work with Mothers who have young children and who also work, and have clients who are businessmen/women who are extremely busy, but each of them still find a way to devote time to their own health and fitness. I really do believe that Training/Fitness is 80-90% psychological and the rest the actual physical. Having the wrong mindset will only set you up for failure, and that can be transferred to anything; approach any task or challenge with the incorrect mindset and you are only destined for failure. Have you ever come across someone who is a pessimist? There every thought is doubtful, they will only give you a negative outlook on absolutely anything you happen to discuss with them, they only see the negative outcome in every situation, these type drag others down – don’t listen to these people, in fact if you can try to avoid them as much as possible. I have learnt not to keep these type of people in my circle. This attitude and mindset is only going to slow you down. When in the wrong mindset the excuses will just keep coming, but instead of finding the excuses, why not try and find the resolutions and ways to succeed or work around these certain setbacks. ‘I don’t have the time’, ‘I am too busy’, ‘I cant afford it’, ‘eating healthy and eating clean is expensive’, ‘I am tired’ and the list goes on, any of this sound familiar to you? Time management is a huge point here, get organised! I mention the busy mothers/fathers and business men/women again because what these people possess and why they are so successful is there brilliant time management skills. Get to bed earlier, get up earlier, stop spending money on coffees and lunches everyday, prepare healthy meals in bulk in advance, that spare 2 hours a night or at the weekend when you are sat watching those pointless soaps are a great time to slot in some preparation and training- overall what I am trying to say is make your health a priority! When you get started and have began your journey you will find a routine that works for you, being hesitant means no decisions have been made to get things moving, not moving means staying put and still being in that same predicament in 3 months time, in 6 months time and so on- and time keeps passing by. We all have goals in life; some people set themselves targets to reach these goals and plan ahead- they begin working towards them. Others are still talking about these goals but not actually doing anything about it- they have great intentions but they just talk/think about them and never get started, they put it off using the same excuses already mentioned above. To be successful we need to write daily/weekly/monthly/yearly goals down-along side this to do lists/tasks, they are a great way to help you keep mentally focussed and continue striving and working towards that end goal. Start doing more rather than saying, keep revisiting your written down tasks. Be realistic and choose your goals wisely. Another important thing is to stop seeing health and fitness as a short-term goal. So many see it as a temporary measure and will only train from time to time, they will commit to training and fitness when getting ready for holiday, to get in shape for a guy/woman they’re trying to impress, or for that New Years resolution after consuming their body weight and more in chocolate and alcohol for whole month. Achieving any health and fitness goal should be about adopting a lifestyle that you continue to follow, you cant expect to achieve results doing a bout of exercise for a fortnight and then deciding to fall back into old habits again. What you need to remember is those old habits that got you into the shape you’re in, again having the right mindset means you see it as a continuous journey, remember to also choose a mode of training/fitness that you know you will enjoy, your more likely to keep it up! 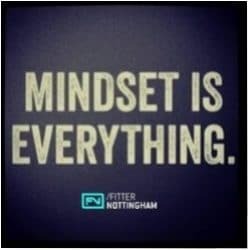 Most of all fix that mindset first- be loyal to your body and believe in yourself and have belief there is a way, if you fall of track one day- get back on it the very next, don’t keep putting it off, your health should always be made a priority!